Over 90 percent of the world’s diamond production, says the Surat Diamond Association, takes place in the city of Surat in Gujarat and yet nothing about the city screams ‘bling’. Perhaps the twin jolts it has received—the Goods and Services Tax (GST) rolled out by the Centre and the tightening regulations following a bank fraud perpetrated by diamantaire Nirav Modi—in recent times explain the fading sheen of the ₹1 lakh crore turnover industry. Before the GST, though, came demonetisation in November 2016, when the government withdrew currency notes of ₹500 and ₹1,000 as legal tender. With liquidity being choked, some small and medium enterprises that survived on cash faced closure for a few months, while bigger players faced shrunken profit margins. “Demonetisation happened in the Diwali season [of 2016], which is why a lot of smaller businesses took two or three months to run smoothly,” says Priyansh Shah of Ankit Gems, one of the largest players in the Surat diamond industry, with a turnover of $310 million (₹2,185 crore) last fiscal and exports to over 25 countries. “Ever since the diamond industry was set up, there was never a time when GST was implemented on labour. 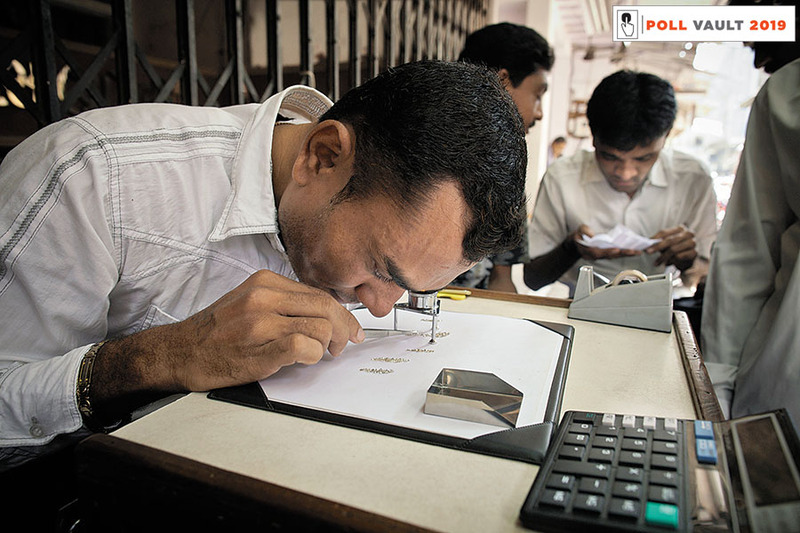 This tax has led to the rise of costs, particularly for the smaller players who are, eventually, forced to shut shop,” says Amrut L Patel of Vishwas Diamond, one of the smaller traders in the market. If the going wasn’t tough enough, the Nirav Modi scam that unfolded last February proved to be the proverbial last nail in the coffin. Ever since the jeweller was accused by the state-owned Punjab National Bank of defrauding it of over ₹14,000 crore, banks have tightened loan regulations for the entire diamond industry. “Till now, banks used to give loans to exporters with a 5 to 5.5 percent interest rate, but now they are not giving loans at all. We are all dependent on banks [for working capital],” says Kalpesh Doshi, CEO, Manya Gems that clocked in a turnover of ₹15 crore in the last fiscal. Manya’s profit margins have shrunk from 5-6 percent to 2 percent in the past year. The depreciating rupee, which has fallen 10.3 percent in the last year, has further shrivelled the margins of the industry, heavily reliant on imports of rough diamonds from across the world, including Russia, South Africa, Belgium and Dubai. At present, about half of the business for smaller players has been trimmed and some haven’t opened since Diwali, says Patel of Vishwas Diamond. A lot of workers have been asked to leave since jewellers, apprehensive of the rupee weakening further, haven’t bought enough rough diamonds. "The lack of timely credit to export-oriented units in Surat and Mumbai due to shrinkage of bank funding, unrealistic and sudden demand for enhancement of collateral security and high bank charges and interest rates by private banks resulted in liquidity crunch for the exporters and thereby affecting their production and export activities," says Pramod Kumar Agrawal, Chairman, GJEPC. As per data provided by the Surat Diamond Association, about 3 lakh people have exited the industry in the last 10 years. The workforce hasn’t been replenished as the younger generation, except for those from among the bigger players, are shying away from the business. 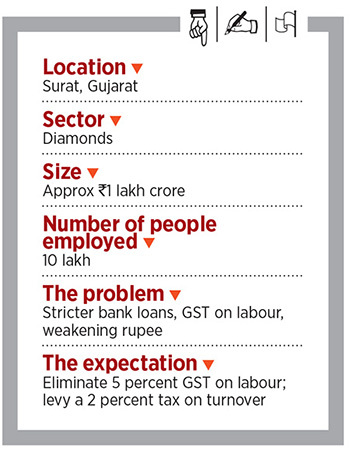 The Surat merchants are now banking on the diamond bourse (worth ₹2,400 crore) being set up by the government in the first quarter of 2020 to bring down its spiraling costs. “We incur additional costs by sending goods to Mumbai and then exporting them. With the sales offices moving from the Bombay Diamond Bourse to Surat, we are hoping things will be a lot easier,” adds Doshi. The industry is also hoping for a 2 percent turnover tax—rather than a tax on income—to be levied in 2019. “The IT department does not understand that although the rough diamond imports are the same for companies, the yield per company is very different since every rough diamond varies. With a turnover tax, this problem will be solved as you will have to pay taxes based on your turnover,” says Navadiya.